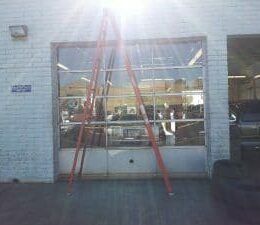 When it comes to commercial doors installation and repair, more Valley companies trust Arizona Glass and Door Connection than anyone else. 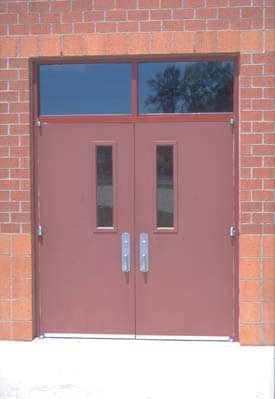 We have over 25 years of experience manufacturing and installing all types of commercial doors here in Arizona. We handle all types of door projects, from overhead garage doors to sliding glass entry doors, to security doors and more. No matter what type of door project you have, we strive for 100% customer satisfaction every time. Aluminum Commercial Doors – Aluminum Doors are the perfect answer providing an attractive choice for the customer where design and Durability is required. 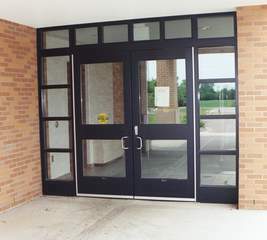 With many features available, Aluminum Doors are known to be well suited for all sorts of commercial installations including hospitals, educational facilities, restaurants and retail, facilities that carry moderate to heavy traffic. 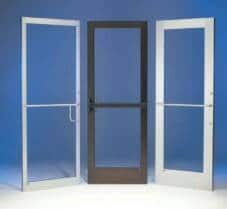 Aluminum doors are also known to handle harsh environmental conditions, such as high humidity and areas where chemicals are stored. These conditions are not suitable for Hollow metal doors, which can corrode. 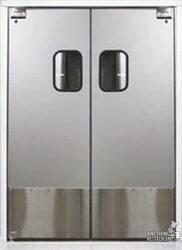 Aluminum Flush Doors – Aluminum flush doors have a sleek look and the strength to last many years. These doors are reinforced by a hardboard backing plate with an aluminum skin on the outer layer. A foam core adds strength, and insulation as well. 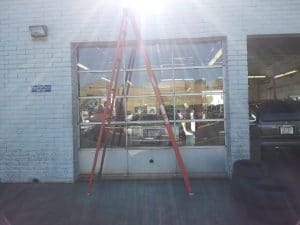 Aluminum Storefront Swing Doors – Aluminum storefront swing doors doors are offered in narrow stile, medium stile, and wide stile configurations,together with optional rails and intermediates, (horizontal and/or vertical) the joints are then further reinforced with a 3/8? steel tie rod and sleeve, this tripled redundancy ensures structural integrity and long term durability. 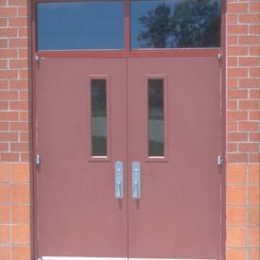 These doors are commonly used in high traffic areas. 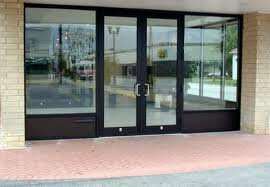 Automatic Doors – Automatic Doors are an easy way for people to access a building and/or your business. They are commonly used as a handicap accessible entry and also provide an energy savings benefit to your business. There are many automatic door options to choose from, the most common types are sliding & swing doors. 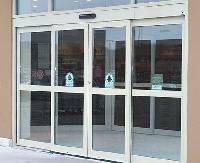 Sliding doors are used as exterior entry doors for large retail businesses and hospitals. Most large volume traffic entry ways use sensors to prevent the door from ever coming into contact with a Customer. Bullet Resistant Doors – Bullet resistant doors and frames are known in our industry to provide one of the highest protections available while still maintaining all door, glazing styles and sizes. This also includes Pre-hung doors with a heavy-duty continuous hinges. 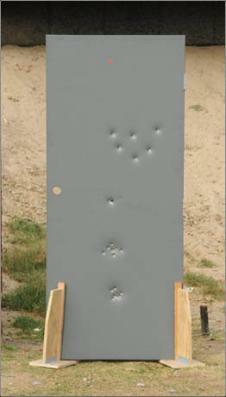 The versatility of bullet resistant doors make this product available in any configuration. 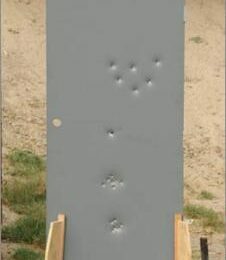 Wood & Hollow Metal style doors are also available with protection levels that included armor piercing and .50 caliber bullet resistant specifications. Cladded Doors– Cladded doors are made up of a metal material that adapts to most metal & wood doors with no machining. 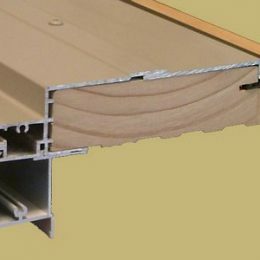 You can use the same weatherstrip and sill systems as your standard & existing door frames. This makes for an efficient door replacement. There are several cladding finishes to choose from. Extrusions made of metal based material add solid durability and security to the door. 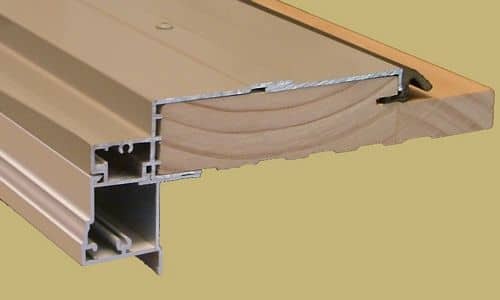 Doors that are cladded with heavy gauge extruded metal such as stainless steel will last for generations and may oxidize over time without degrading the metal. Fiberglass Doors – Fiberglass doors are often the best value when it comes to flexibility and durability requiring very little maintenance. The composition of fiberglass is very useful when it comes to doors because of its resistance to dents, scratches and warping. Fiberglass doors can be molded into the look and feel of the grain on a wood door, or the smooth look and feel of Cherry Oak, along with other popular varieties of wood. Heavy Duty Aluminum – Heavy duty aluminum doors and frame entrance packages are ideal for locations subjected to extremely high traffic flow. The corner construction is mechanically fastened and welded. Offset hung doors are supplied with heavy duty hinges or pivot sets. These parts are commonly fastened or welded. Hinges or pivot sets are available in an array of architectural coatings and anodized finishes. Herculite Doors – Herculite doors are primarily frameless glass doors that are beautiful and classic. Commonly used for entry ways without structural framing, Herculite Doors & Windows (frameless glass windows/panels) can be seen in most of your big malls, Plazas and offices buildings. Because of the overall thickness and strength needs, the material is made of tempered glass. Hollow Metal Fire Rated Doors – Hollow Metal Fire Rated Doors and Frames are made of steel. These door types minimize property damage during a fire & play a vital role in keeping people safe. Hollow metal Fire rated door openings are classified by their locations in a building, based on the potential fire hazard of that particular area. Location determines the length of exposure protection required. Overhead Doors – Overhead doors are designed for a wide variety of projects. These doors are fabricated from interlocking steel, aluminum slats, or stainless steel curtains, offering great serviceability and a wide variety of profiles. 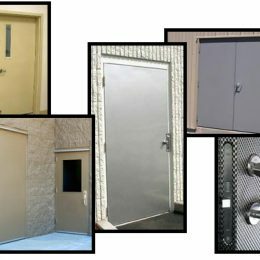 Overhead Service Doors are computer designed to your specifications creating an efficient and safe installation. 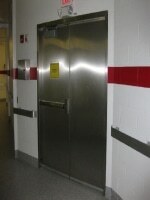 Standard, Custom, or heavy commercial applications are available with these doors. Security Doors – There are many security doors available to choose from and many ideal locations for a security door to hang. It is very important that you get the right security door for the cause. Residential and commercial security doors are different though it is possible to get the Design outcome you need using heavy security doors, if it’s in your budget. If not, there are standard desig products that provide a high level of security for your needs. Security Gates – Security Gates are typically constructed with steel tubing and provide a combination of security and elegance commonly used for large industrial complexes that want storefront or perimeter security. 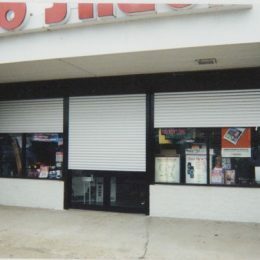 Security Shutters – Whether you are looking for security or Sun Control, custom security shutters might be the choice. 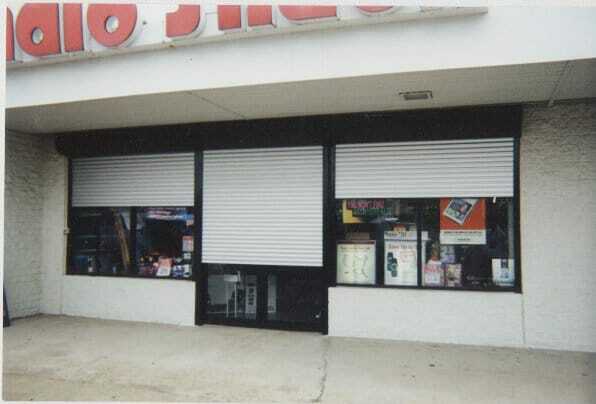 Nowadays, people think of shutters covering a window or door however, todays shutters are way more advanced specializing in motors and control systems for the custom retractable awnings. 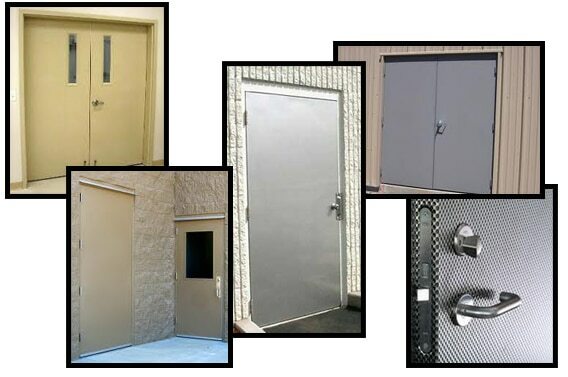 Service Doors – Normally made of a non-corrosive material and typically hung with spring loaded hinges, Service doors are commonly used for an entrance intended for food service and removal of refuse along with security and ease of access for delivery staff. 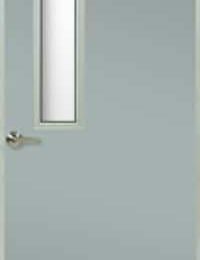 Stainless Steel Doors – Stainless Steel Doors and frames satisfy both performance and design, it is assured by aggressive testing, utilizing suitable gauges alloys, and finishes. Stainless Steel Interior Components/hardware reinforcements, and anchors insures that the products will not warp or rust – inside or out. Storefront Doors – Store Front Door Systems are made up of a high endurance aluminum material & is designed for simplicity using integral screw-spline & snap-in joinery which allows for the framework to be pre-assembled in panels resulting in increased productivity and quality control. Another advantage to using this system is that it provides an excellent water control & diversion.